"Laal’s new and most revolutionary video to date. Please paste to your profile to spread awareness against religious extremism." Thus spake the Twitter-feed of Laal the band’s lead singer, guitarist-songwriter-Marxist-academic-revolutionary Dr. Taimur Rahman, announcing the upload of the band’s latest track onto YouTube. The song, which features an anti-American/CIA/ISI visual collage, plus Comrade Taimur's delightfully uninhibited-by-hipness moves, and a chorus of "Dehshatgardi Murdabad" (Death to Terrorism), hasn’t received as much hype as some of their earlier offerings. One theory is that this is not because of its subject matter, or the moves (you know someone is committed to their cause when they even dance earnestly), but because it simply isn’t good music. (Though some people feel that a song that incorporates spitting out the words "Pitthoo", "Chamchay" and "Tattu" deserves the same special cult status reserved for e.g. films by Ed Wood.) Still, it has accumulated more than its fair share of ‘this rocks’ and ‘I love it’ and ‘brilliant!’ in the etherworld. Another reason why Laal hasn’t received the adulation they usually receive from the proletariat might be that, in this month’s anthem for doomed youth by doomed youth race, they were pipped to the post by the Lahori trio, the delightfully named Beyghairat Brigade. Their debut single Aalu Anday – which an objective analysis suggests has no musical merit but does include references to nobel laureate Abdus Salam, a poke at hypocritical piety and a slew of made-for-T-shirts slogans – went viral, then epidemic. "Personally I also think you underestimate the Aalu Anday video's sociological/ cultural significance in an environment where "radical" is usually attached to musicians who attack thr US' policies or drones or terrorism (can we get any more safe consensus?). Whatever you may think of the quality of the music - which is no doubt basic - I think the real reason it struck a chord is because it's the first time any of the conspiracy theories / looney ideologies of the right were taken on in musical format on television and that too in a light satirical way rather than the hammer (and sickle) on the head style of Laal." It is these hyperbolic reactions, and not the songs themselves or the issues they inhabit, that I’ve been thinking about. Sometimes I feel the bar has been set so low only pygmies can limbo safely beneath it. Which brings me to the third subject of this post, Imran Khan. That’s right. Immy Bhai. Also known, since yesterday, as Yes We Khan, The Face Of Our Future, The Country’s New Beginning and Pakistan’s Last Hope. Now, you might be asking, what do revolutionary private dancers, satirical musical hobbyists and Imran Khan have in common? One, good intentions, which, as some of you might have heard, are the Devil’s Envicrete. Two, a youthful embrace, which, as some of you might also have heard, might be wonderful at the time but really does not compare to the ministrations of a slightly more experienced lover. For this position, this notion of life in continuity instead of life just now, I might well be called a cynic. But I think there is a pattern here. Life has taught Pakistanis to diminish their expectations rather than maintain them, and our rush to embrace the mediocre as a heartbreaking work of staggering genius, just because the young do, makes those of us who really should know better complicit in this sorry state of affairs. So celebrate, by all means, good things like earnest young musicians, smartass kids and politicians finally being able to actualize their messianic fantasies. Just don’t act like it’s the second coming of Christ, fer Chrissake. "I’d be more optimistic if he’d suggested he was going to deal with extremism by following Bangladesh’s keep-religion-out-of-politics lead rather than praying on stage’ and ‘a flock of 300,000 sheep is still a flock of sheep." - Exactly. I don't think our majority would even let him finish his sentence the moment he takes on this religion-out-of-state business. This is our reality, and might serve you well as soon as you too realize and accept it. I personally have come to this conclusion that he is just playing a double game, and trying to keep up with all this right wing attitude. Because no matter what he believes in reality, he knows deep down that without them, he won't have a chance in thousand years. I don't think he's a closeted taliban (based on his book). And even in his rally/concert, he made a reference to sufi saint (data sahab) and had pop bands perform. People with wahabi ideology consider all of this plain shirk. In Pakistan, our politic is at a point that it can't just be black or white. There are very weird shades of grey (aka hypocrisy) and anyone hoping for premiership would have to swim through this filth even if he personally don't agree with it. But once he is in power, I hope he gets more focused and breaks off these unnecessary right wing alliances. Well his big moment was sponsored buy PPP, SSP, LeJ, JeM, and JI. What kind of ideology he is following, may be Gen Zia's little black book will give you an idea. "I don’t have to have a bouffant to think he is right to demand politicians declare their real assets." I sincerely believe that we cannot pedal back - or forward to the renaissance/post renaissance era with the segregation of the church and state. Religion, in our case and region is so intertwined that the best possible, in fact the only progressive way is to find a new equilibrium between religion and state. In that respect, I would like to believe that theoretically Islam has provisions within its structure for such an equilibrium to exist given the right system and right people are in charge! See pyala, here's the thing.. Sometimes along the road to cynicism you often become the very quintessence of the archetype one would instinctively oppose - a troll. Now I can understand your lack of enthusiasm about Imran Khan and/or the vacuousness/hazards of his policies/political partners. There’ll be plenty of debate about that in the months to come anyway. But in the case of this unnecessary three-way analogy, I feel you've massively overreached your critical license here. I find it offensively crude how you just dissed Beygairat Brigade and likened them to 'pygmies' just in order to make your clever little analogy about Immy K.
First off, 'the song has no musical merit'? Seriously, Mozart? Not good enough for your oh-so-honed ears that seem to have arrived at an objective criterion for measuring musical aesthetics? I, along with many others, find the song (completely separately from its 'message') to be an expressly well-composed number even if simple enough to be catchy. It's no bohemian rhapsody in its musical complexity sure, but only someone with a certain degree of critical hubris would completely disregard its merit. But the sheer hypocrisy of your critique is astounding in itself - you're referring to a band that has taken on and ridiculed the army, qadri, qasab, PTI, taliban, JI in the full glare of the media, while singing in a popularly understood language as 'pygmies'? While your own claim to fame (however many you are) lies in safe, anonymous blogging in cyberspace in a language that 3% of the populace can understand? Honestly? Just in order to make your little point? Massive loss of respect right there. Grow up, guys. No one likes a troll. I think you needed to be far more vicious about that appalling piece of musical terrorism perpetrated by Laal. It's so bad it's almost good. But still bad. Similarly, I agree with Amaar that Aalu Ande is a thousand times cleverer and wittier and it is unfair to lump it with that cringe-making Laal atrocity. THANK YOU for seeing things as they are rather than over praising the mediocre. Seems like if you don't jump of the IK band wagon you're going to be considered a whack. Another writing trying to play down Imran Khan. But you must admit and have been forced to admit, but you cannot express that the Jalsa was by far the largest in history. Neither Nawaz, BB, Bhutto or any of their likes could even muster half of the crowd. Even if they came up with half the number they would be paid jiyales brought by force from rural areas. What stupid rhetpric you present. Shame on you Pyala. How can you guys not realize that Imran IS the second coming of Jesus!! And I base this claim on one groovy jalsa. ^^^ you had me at inject telcum powder. muah lols! I think MSS let annoyance with superlatives being handed out like halloween candy get to him/her. To say Aaloo Anday has no musical merit is almost as egregiously under-egging the pudding as the over-egging indulged in by 'whats in a name' up above with regards to immi bhai's size... err, jalsa size that is. Writing good songs is not an easy task, where the catchiness of the music is matched by the the cleverness of the lyrics. To do so with subtlety is an even rarer occurrence, and must be duly appreciated. Aaloo anday actually manages to pull it off with a level of simplicity that, to be quite honest, is astoundingly mature for a first song. So yes, let's not heap praise on mediocrity or treat every hopeful utterance as a sign of the second coming, but let's also not let our jaded cynicism cloud our ability to give talent its due credit. Fair enough, though I do wonder about your notion of subtlety and feel it being a rare occurrence is not entirely accurate post-coke studio. Musical likes and dislikes are a completely subjective thing. I am perfectly open to the idea that composition-wise aalu anday is a good first song, even if I don't happen to think so, and look forward to more from them. I also happen to like Laal, and TR's dancing. In fact, I wish I could dance like that and have been practicing quietly, in the bathroom, with my laptop perched on the commode so I can copy the moves in the mirror. The wider point I was trying to make though has nothing to do with whether the music is good or not or IK is OK or not, but does indeed have everything to do with the indiscriminate use of superlatives. Words are currency and I hate to see them devalued. I would like to see nuance in our intimate language, insight in our public speech, think the two are connected, and believe perspective is not a kind of plastic. If this makes me a jaded cynic, so be it. Get a full length mirror for your room, spare us the bathroom antics anecdotes. And good luck with hoping people start using their second/third language correctly. 'good luck with hoping people start using their second/third language correctly'. Why? Because Pakistanis are stupid and incapable of learning? Only Englishmen can play cricket? The guitar is a traditional Punjabi stringed instrument? No... because it's statistically unlikely. Try observing an English Language class at a Govt. school, you'll revert back to your cynical self. Language acquisition is a complex task, it's not about being stupid or incapable, although you cannot deny the role of intelligence, it's about correct instruction in the first place. But then again Hope springs eternal! I came to give my two cents on the post but I think I'll pass. At least this one time. 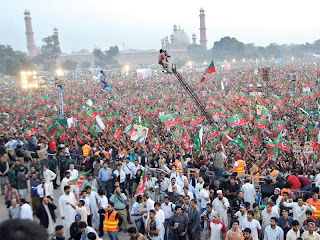 But quickly going to mention, if the majority is silently jumping the Support-ImranKhan bandwagon, then the other side needs to write super critical articles and posts, if only to keep balance. And people should respect that. "show me your policies before I give you my vote"
you forgot to add if he doesn't comply, I will continue to vote Zardari/Nawaz/Altaf, because their policies are so much better. man, someone really needed to say this. i'm so sick of people glorifying everything from recycled dumb ideas for social enterprise to overpriced musicals and attention-hungry no talents with great pr shoving their ways to the top of international awards lists in technology and film-making alike. and misbah-ul-haq. god knows i hate his fans more than i can ever hate his mediocre and darpoke game. i'd like to point out that "dr" rehman did his PHD via a HEC sponsored scholarship which in turn means that the $ indirectly came from USAID. I wonder how that falls into place for his marxist philosophy? Policies? My foot. I found your snobbish comments about Imran quite repellent. What are the policies of Z and Co, pray? Do you not have the basic common sense to see that the mere possibility of honest men and women putting an end to unbridled corruption and lawlessness indulged in my "elected parliamentarians" is nothing short of a revolutionary idea in today's Pakistan? Simplicity and simple, home-spun ideas is what Pakistan needs at the moment. We have had enough of the cleverness, snobbery and glittery sophistication of westernised Pakis, devoid of honour and self-esteem.